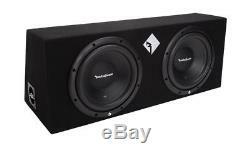 Rockford Fosgate R1-2X10 10 800W Loaded Subwoofer Sub Enclosure+ Boss Amp+ Kit. Part Number: R1-2X10 + AR1500M + AKS8. 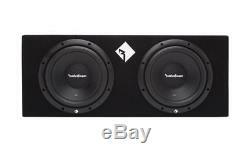 New Rockford Fosgate R1 2X10 10 800 Watts Dual Loaded Subwoofer Sub Enclosure. 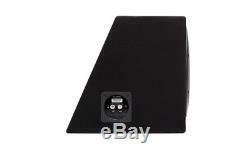 Rockford loaded subwoofer enclosure Boss Mono amplifier Amplifier installation kit. We are an authorized Rockford Fosgate dealer. The Rockford Fosgate R1 2X10 is a loaded enclosure containing dual 10 subwoofers constructed with durable MDF, high density carpet, and features quick release terminals to promptly remove or replace the enclosure in your ride. The Boss AR1500M MONO class a/b amplifier features a MAX power of 1500 watts and a RMS power of 700 watts at 4 ohm. Other features include a MOSFET power supply, class A/B circuitry, 2 ohm stable and a low pass crossover. Also, includes a remote bass control. The BOSS AR1500M amplifier is the perfect amp to power your car audio system! This 8 Gauge amplifier installation kit has everything your need to wire your car audio system! It features a 20 foot 8 gauge red power cable, competition high quality fuse holder, 3 feet of 8 gauge black ground cable, 16 feet of 18 gauge blue turn on wire, a 20 foot high performance RCA interconnect, 30 feet of speaker wire, 6 feet of split loom tubing, (20) 4" wire ties, (3) rubber grommets, a #10 ring terminal, a 5/16" ring terminal, and a 1/4 ring terminal. Give your car audio system the best wire available with the BOSS KIT2 8 Gauge Complete Car Amplifier Wiring Kit! Optimized for Sealed & Vented Enclosures. Covered with High Density Carpet. Dimensions: H 12.2" x W 30.12" x D 12.11. Item Weight: 36.85 lbs. Armor Series 1500 Watt Mono Car Amplifier. Signal to Noise Ratio: >105dB. Dimensions: 6.5" W x 2.625" H x 11 11/32L. 20 foot 8 gauge red power cable. Competition high quality fuse holder. 0.25 inch gold plated ring terminal. 3 foot 8 gauge black ground cable. Number 10 gold plated ring terminal. 16 foot 18 gauge blue turn on wire. 20 foot high performance RCA interconnect. 0.3125 inch gold plated ring terminal. 6 foot split loom tubing. 20, 4 inch wire ties. Rockford Fosgate is terrifying to those that dont understand. Why would a person want thousands of watts of Rockford Fosgate® power in an amplifier that is bigger than most cars are wide? Because sometimes - too much is perfect! Rockford Fosgate® is ready for the future. We incorporate some of the most state-of-the-art facilities in the audio business. Best of all, our Amplifiers, Signal Processors and Woofers are designed and engineered in Tempe, AZ, USA! Cancelling Your Order: Your order is important to us and will be processed immediately. Select the reason for the return. This listing is currently undergoing maintenance, we apologise for any inconvenience caused. 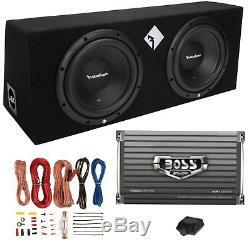 The item "Rockford Fosgate R1-2X10 10 800W Loaded Subwoofer Sub Enclosure+ Boss Amp+ Kit" is in sale since Wednesday, July 15, 2015.